Cryptocurrencies are entering the mainstream. In Malaysia, they have started to attract the interest of high-net-worth individuals (HNWIs) and ultra-HNWIs, who have hitherto stayed away as the asset class was deemed too risky. It helps if one of your trusted peers leads the way. Technopreneur and angel investor Datuk Wei Chuan Beng got into the technology a year ago. Everyone was talking about it and he wanted to know what all the fuss was about. After separating the gold from the dross, Wei realised that it was a much bigger deal than he had suspected. “I found that the impact of blockchain was far greater than that of many other technologies, but it was not so well understood yet. In fact, if properly harnessed, it could have a huge impact on the country and region,” he tells Personal Wealth at an interview during a YPO (a global platform for chief executives) event in Kuala Lumpur recently. International Bhd and is used to leading the pack when it comes to new technologies. During the YPO event, Wei chaired a session on “Old Money versus New Money”, where everything from fundraising to mining to regulatory issues was discussed. “I think these industry leaders, who may be HNWIs or even ultra-HNWIs, have heard of blockchain, cryptocurrency or bitcoin. But from what I know, they tend to hear only the bad news. They are used to the ‘old’ fiat money, so ‘new’ money such as cryptocurrencies and the technology that backs these confuse them,” he says. Wei is keen to have more such sessions to spark discussions among YPO members. The more they talk about it, the more they will understand the technology and the underlying opportunities. Hervé Larren, who was the main speaker at the “Old Money versus New Money” session, talked about investors allocating 1% to 5% of their portfolios to cryptocurrencies, just in case they turn out to be something valuable. “You hold a small amount so as not to miss out or be considered a fool for not having it in the first place. Cryptocurrencies can act as a hedging tool in a scenario where real-world assets are collapsing,” he says. The easiest way to do this allocation is by the percentage of market capitalisation, says Larren. If bitcoin currently represents 50% of the entire market capitalisation of cryptocurrencies, then it is rational for an investor to keep half of his 1% to 5% allocation to cryptocurrencies in bitcoin. About 10% of the allocation can be put into riskier cryptocurrencies while the rest can be invested in more stable cryptocurrencies such as ethereum and ripple. When it comes to blockchain or cryptocurrency investments, it is still early days yet. Larren points out that the big players are still on the sidelines. So, there is time to get in and make some money. Typically, in any start-up, the first investors are usually HNWIs acting as angel investors. Once the start-up has grown to a certain size, it attracts several rounds of venture capital. The large institutional players come in just before the company is listed and its shares are available to retail investors. “In the cryptocurrency market, it is the reverse. Retail investors are the ones who take the most risk at the start of the asset launch. They understand and believe in the technology when the institutional investors are still on the sidelines. Half the institutional investors say they are waiting for more regulations while the risk-takers, who saw the business opportunity, have set up a cryptocurrency trading desk,” says Larren. But to HNWIs and UHNWIs, even 1% of their portfolio is a huge amount of money. That is why they should adopt the approach they use in their stock investments, says Larren. “You have to do due diligence on your investments. You should not invest in Amazon, for example, if you do not understand its core business and growth potential. The same applies to cryptocurrencies. You should not invest in them if you do not understand the basics and how these asset can grow,” he adds. Today, there is a lot of confusion surrounding cryptocurrencies, especially initial coin offerings (ICO). Investors buy tokens from companies with questionable track records and value propositions, hoping to generate a huge profit from being early adopters. 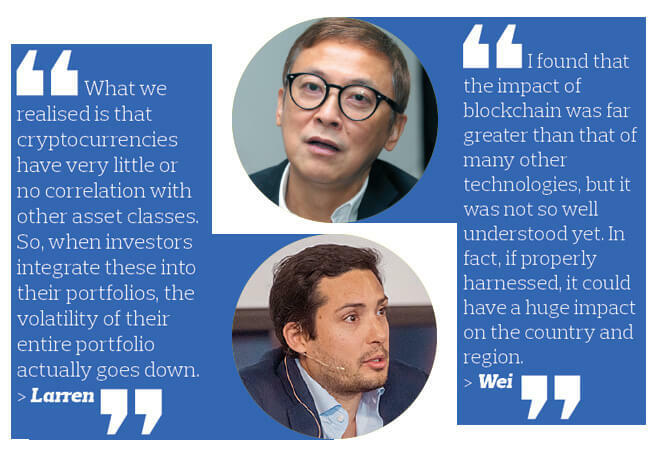 To avoid being caught in a bad ICO investment, Wei usually starts by analysing the cryptocurrency developers’ business model and the validity of their proposition to the community that they plan to serve. “This way, it is quite easy to differentiate between a genuine and a fake project. Fake projects usually have shaky propositions. They say things like, ‘If you invest US$1 today, it becomes US$20 tomorrow. What kind of magic is that?” he says. In the stock market, minority shareholders typically do not have direct access to the companies they invest in. But in the cryptocurrency market, most developers establish their own social messaging platforms, allowing investors to ask any questions they want addressed. “They use platforms such as Telegram and Reddit to answer questions from the community. And these exchanges are transparent to everyone in the group. If the developers do not respond, the community will not have confidence in their product. So, this is a good form of check and balance,” says Wei. He should know. He launched his own ICO in March and found that the process was more onerous than listing a company, which he did back in the early 2000s. To list a company, for example, one can hire a very good auditor to help with the publishing of the financial report. The company does not have to be answerable to anyone about the financial report because it has stated that the information has been verified. “The company can also write a business prospectus that comes with hundreds of disclaimers, which essentially say, ‘If anything goes wrong, don’t come to us.’ This is mind-boggling because the prospectus is supposed to be something that would hold them accountable,” says Wei. Most HNWIs and UHNWIs rely on their private bankers or wealth managers to help them make investment decisions. However, very rarely do any private bankers or wealth managers recommend cryptocurrencies. Wei says that is mostly because they do not receive commissions from such investments. So if an investor wants to invest in cryptocurrencies, he has to do so on his own initiative.